Time for a fluffy post, in both senses of the word. “Adorable kitties” isn’t the first thing that comes to mind when you have to make a trip to the DMV. 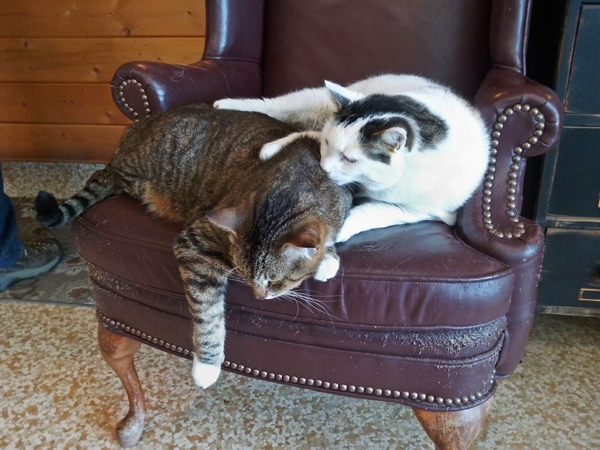 I was dreading registering my car this week, but a friend turned me on to the Department of Licensing agency in Aberdeen, Wa., where we were greeted at the door by two adorable and very friendly cats. There were three more in the waiting area. When it was our turn at the agent’s window, we were astonished to see that the office behind her was more like an animal shelter. There were chickens, ferrets, a parrot, a magnificent cockatiel, a perky young German shepherd, and others I can’t recall. Mind you, the office isn’t that big, and they were all getting along with each other. Greeting apparently is a demanding job, though, requiring periodic catnaps. Seeing these two on my way out the door made me forget momentarily that I’d just paid hundreds of dollars in registration fees and taxes. I also recall reading some years ago, perhaps in the Wall Street Journal, about a law firm that had 13 cats in its office. They found them to be a big net plus for business. We’ve had decades of right-wind financed demonization of government, to the point that a lot of people are prejudiced against it even though many agencies function well. Even though bureaucracies are, well, bureaucratic because they have to operate with laws and regulations, given how much crapification and looting goes on in the private sector on a routine basis, it’s not as if businesspeople have a valid basis for claiming a moral or efficiency high ground, save with respect to lining their own pockets. Now of course there are many practical issues to solve. People in the office would need to take care of the critters. If they were government pets, as opposed to personal pets allowed to hang out in and live overnight in government offices, the kibble and litter and vet expenditures would need to be budgeted. But this could wind up being cheaper than other forms of PR. And if they were personal pets allowed to play a dual role as daytime government greeters, how would they be screened to make sure they were calm and well behaved enough? More serious is that some people (both government workers and citizens visiting offices) might be allergic or phobic. But I’ve regularly seen cats in stores (health food and news stands seem to be the biggest users of store cats) so this doesn’t seem to come up often as an issue. However, citizens can’t necessarily avoid going to certain government offices, while cat (or dog or ferret or parrot) haters have the luxury of boycotting stores with animals they don’t like. So I hope this idea gets traction, but I doubt it will get beyond offices in small to medium sized communities that tolerate a certain amount of character. Readers? Well, as speaking as both an allergy sufferer (I’ve always hated how tragic that sounds), and a cat lover, and even in my role as a DMV want to get out of-er, this idea sounds frought with peril. Just saying. But it could class up the joint. A Rabbit and a Tortoise, for employee performance reviews. A Bat for a driver’s instructor? Speaking as another with a cat allergy, much as I love the idea of animals in the workplace, it would be untenable for me – I can get an asthma attack just sitting on a chair where a cat has been sleeping. Its a very common allergy (apparently its cause is a a glycoprotein uniquely found in cat saliva, which they use to condition their fur). Persons with cat allergies are already over-represented in comments! Percentage of U.S. households with one or more dogs (2012): 36.5%. Percentage of U.S. households with one or more cats: (2012) 30.4%. Percentage of all U.S. households with detectable levels of dog and cat dander: 100%. I would prefer not to have to deal with animals in public facilities and places of business. Normally, I would agree. However, a local nursery, where I buy plants for my garden, has a cat that sleeps in a cardboard carry-out box on the checkout counter. I’m told she’s a good mouser. Like some others, I am allergic to cats, but I’d prefer not to be dodging mice when I walk through the hoop houses. I tolerate the neighborhood felines, as long as they’re on the OTHER SIDE of our fence … the bird appreciate it greatly ! Now, if we’re talkin raccoons, … well .. the little devils ! Another side to this issue – in our neighborhood, many owners of cats have released them into the wild, or let them out during the day when they are at work (or can’t be bothered by daily care of said pet). It seems some neighbors have done an informal statistical survey of this behavior, and noticed that the number of loose cats has risen by large numbers since the downturn of 2009. I do love cats, even though I have allergies as well. So this nonchalant “please release me” kind of rubs the wrong way. Some of the better looking cats get fed by others in the neighborhood, but the ones who have been in fights and lost…not so much. So much for a class analysis of feline populations. Arizona Slim: Thanks. As someone who grew up with dogs and likes dogs, I agree. And I note that I have to state that I like dogs–it is on the order of “I support our troops.” There is simply too much of Love Me, Love My Dog these days, as dogs become increasingly accessorized, increasingly bred to be sickly, and increasingly are substitutes for having a child. I was recently reminded of that when some knucklehead dragged his cocker-pug through a liquor store, clearing the way ahead of him. The issue of owners having pets in a store isn’t just about allergies: I use a frame shop and photo restorer who has a yappy, mistrustful spaniel (small, maybe a King Charles). The whole transaction in a small shop ends up abbreviated and fraught. And even though many commenters have lamented that kids don’t have as much leeway these days, I’m not so sure that I want animals in public spaces and stores for the simple reason that many animals have to taught to tolerate children. This is the case with dogs and parrots. I like Yves’s idea of animals in airports: The thematic animal would be birds. Because so many people are going through airports, and because of the threat of disease is an issue, a separate aviary would be intriguing, distracting (which seems to be what some passengers require), and colorful. And, yes, I like dogs and I support our troops. Note that I don’t say whether I like dogs or not. What difference does it make? All l am saying is that I would rather not have to deal with animals in public facilities or places of business. I’m there to interact with people. Arizona Slim: Agreed. I am there to interact with people. My point is that we are now obligated to gush over animals in public, which may be a separate issue. But it is part of the culture these days. People talk to the dog instead of to each other. Arizona Slim: Screw people. I prefer to interact with pets in public places. Sheltered animals were fed and watered, day and night, by volunteers. All of the feed and hay was donated by local stores. As an animal lover, I think this is a terrific idea. I’m wondering if there could be a workaround for the allergic folk. Are there certain breeds people can tolerate? For example, poodles? IIRC, their fur is less allergenic than most? A poodle rescue would be wonderful compromise. And hairless dogs and/or any other hypoallergenic beasts and/or birds. Would anyone with more info on this issue advise? To staff the joint with hypoallergenic rescue pups (just fantasizing! ), there are breed-specific rescue groups everywhere. You can find them by zip code on petfinder.com. My allergist informs me that the notion that certain breeds of dogs and cats are hypoallergenic is a myth. The allergens seem to be predominately in the saliva, not the fur itself. Cats are the absolute worst for me, although the shots seem to have helped quite a bit (I can tolerate brief exposure now). I’d still be incapacitated if I had to be around cats for a long period of time. Just no conniving sharks, venomous snakes, ravening wolves, rats, hungry barracudas, loathsome cockroaches, pathetic mice and “keep my head down so I dont rock the boat” sheep. (That all sounds like the private sector, but with the revolving door you never know!). Also no more “top dogs”. There’s already too many. It depends on the kinds of animals! Moderate Camels would be good. The front hump is low, the back hump high and always frazzled looking. They spit at Mullahs, making a worthwhile PC political statement. Seat belts could be bolted to the humps, making them kid friendly. They are self-driving already, and kevetch incessantly (especially the females, but the guys are bad, too) but they never run and they don’t need turn signals for collision avoidance. They are great for large cities, not needing water and you only take them to the camel filling station once a week. There is no real need for transportation anywhere else in the country. Deplorables don’t go anywhere, anyway. Used bookstores have long had cats on staff. Aside from customer relations duties, a cat is invaluable in preventing inventory reduction by mice. They’re also real good for just laying on stuff, and spreading out, and also at stretching. Also, I am a schoolteacher and I need to say that nearly every year I read my class “Catalog Cats” , from the book Tales Julian Tells. If you want the best story about putting cats to work, that is it. Go read it now. Wait. Mice is a real job. Sorry, I didn’t mean to make fun of that! As a cat lover I love this idea. The thrift store where I shop has a cat. I have noticed that is she is not around people ask about her, so I am not the only cat person around. A place of business goes up in my estimation if it has a cat or a dog. I’d be in favor of more plants and animals fully integrated into more aspects of life. More shady trees, nuts and berries to snack on and watching the birds, squirrels and other animals eat them and the cats eating the birds sounds like it would be fun enough to get people off their phones/tablets. My mother in law spent most of her life in concrete and traffic filled sao paulo, brazil. I brought her to a park to feed some ducks and she was giddy and had as much fun as my six-year old. There are certain breeds of cats that are considered hypoallergenic cat breeds. They might be the best option and there are quite a few such breeds. An example being the Siberian Forest Cat, which has a lower amount of the protein Fel d 1, that cause human allergies. Keep in mind though that Hypoallergenic means less allergenic, not the fact that there is no allergy. If someone has an anaphylactic allergy to certain pets, that could be an issue. I thought this post would be about replacing the “animals” we have in public office. I live in NJ where we look forward to an upcoming election for state governor. Given our present governor and recalling our past governors I think a fat lazy house cat as governor would be a big improvement. Given the choices currently on offer for governor I am very tempted to write-in “fluffy”. Noting how well our Congress works in representing our interests I think a Congress of friendly housecats would get a lot more beneficial legislation passed and far better represent the interests of the American people than the animals we currently have in Congress. It would also reduce the costs of “maintaining” our Representatives and Senators. Certainly no cat could be more Mercurial than our current President and would do far less harm to our ship of state. Congress is not full of cats – it’s full of rats. Like Jeremy, when I read the title, I thought that the animals might be selected to represent the qualities of elected members of the government and I was wondering what animal might represent, for example, the Prime Minister. Then, I stopped myself when I realized that making human/animal comparisons is detrimental to the animal kingdom. I nixed the idea and just read what I was given. I am already served by animals, the Homo Sapiens species. Addition of a more of the forgiving animals would be an improvement. Flocks of Chickens in the White House garden? Herds of Big game for the Pentagon? Either Packs of Hyenas for Congress (trained to consume professional lobbyists), or a herd of Elephant – Elephant are very smart, and very protective of each other. Just give Bezos a little more time – he’ll change that. Bezos’ problems come when he tries to lay off his robot slaves. The slave owners (bankers and bondholders) are unforgiving under these circumstances. My family has asthma and cat allergies, so in order to have a cat, we bought a Siberian from a breeder whose cats and previous litters had all tested for low allergen levels in their saliva. Worked out well for us, but it was expensive. MIT is the only college that officially allows cats in certain of its dorms. They found (for the non-allergic, at least) that cats lessened students’ stress levels. As an animal lover, I always enjoy animals in places of business. I find that nature, both flora and fauna, nourishes my soul. I even find the Antidote Du Jour’s on here a welcome relief from the often brutal truth of what’s really happening in this world. Yet regarding animals in such large places as airports (or even DMV’s? ), I would worry about not only human’s allergies but the well-being of the animals themselves since humans are not always kind and can really mess with a critters psyche. Scientific studies have shown how looking into a dog’s eyes releases oxytocin. I remember a link on here in recent months (can’t find it now! ), that said even a green lot in a big city lowers people’s blood pressure when walking past it, and how Pollock’s paintings are popular since they mimic the shapes found in nature. Even photographs of animals and flora can be healthy for us. So may I suggest a compromise that would reap many of the benefits but be much more cost effective, with no adverse effects to those suffering allergies? Project movies or photos of flora and fauna and puppy dogs for those forced to wait. It would entertain young and old alike (and maybe even get folks off of their ‘smart’ phones). There are more than enough photos and videos to last for months. An added bonus could even be that those same (voting?) people may then consider the importance of preserving our national parks and monuments, voting against pipelines going through miles of nature in the name of energy greed, or the selling/privatizing of federal lands. I was once greeted by a sweet cocker spaniel in a small bank in the midwest. I love dogs, I and I thought what a wonderful idea. Animals do humanize many settings and bring calm, and contribute to a soothing environment in otherwise stressful places (for me). Airports would be a great place to have them, and in fact, I think some do have them to “de-stress” people. Lately, I’ve seen more and more dogs in grocery stores and even in some restaurants that don’t appear to be service dogs. I don’t mind it, but I can understand why a lot of people would draw the line here. For some reason, cats belong in libraries and bookstores. I think this could be done and will suggest it to our local animal shelter. The local shelter is a relatively large operation with lots of volunteers, activities, and donations. I think the setup that makes the most sense would be to have displays of cat kennels featuring cats up for adoption. This way the animals only need to be tended to once or twice daily, unlike dogs. Also, I have seen enclosures in pet stores and animal shelters where the cats are in condos an inch or two behind plexiglass, which minimizes the problem of dander, allergies, odor, etc. and is also better for the cats to have a buffer from children tapping on the cages. The shelter could provide almost everything, including the cats, enclosures, volunteers, food, litter, etc. Most other issues could be worked out. It helps to have volunteers and experience with lawyers and insurance companies. The big downside is it wouldn’t be as entertaining for visitors as cats sleep 23+ hours a day. In the early 1990s, when I was living in California, I got caught in a speed trap and got a ticket. I don’t know if they still do it there, but at the time, you could get the ticket expunged from your record by attending a remedial driver’s education class. An entire cottage industry sprang up to make it more appealing. There was comedy driver’s class, cooking driver’s class, and maybe one for singles. I took the regular old boring class just to get it over with. In Washington state, the DOL offices (DMV in most other states) are now all independent agencies that contract with state government, so you could have the animal DMV, the dogs-only DMV, the fish tank DMV, the pet rock DMV for those allergic to animals, and the plain old boring DMV for the sticks-in-the-mud who think government is serious business that shouldn’t be trivialized in such an undignified fashion. There are enough agencies, especially in the metro areas, that vehicle owners with animal allergies would have options. Conversely, those with dust allergies or who break out in hives when exposed to toxic bureaucracy would be advised to medicate prior to their trip. He’s well known and loved by students, staff and the community. OMG, a cat in a greenhouse, is that a made-for-NC antidote or what? I suppose you’d have to request permission to avoid copyright infringement, but it’s hard to imagine they would deny it. You probably even could say that Basil has a college education.